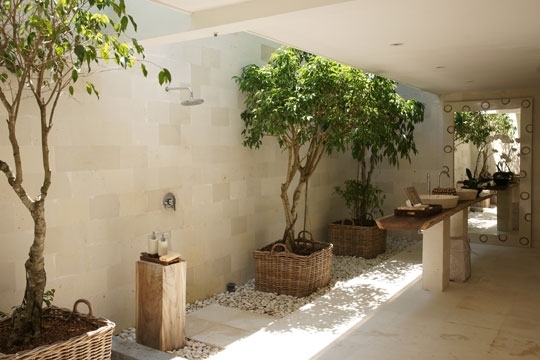 One of an enclave of three staffed villas, complete with a holistic spa, 4-bedroom Villa Oazia White rests within a serene, tree shaded, riverside setting, just 6km from lively Seminyak. 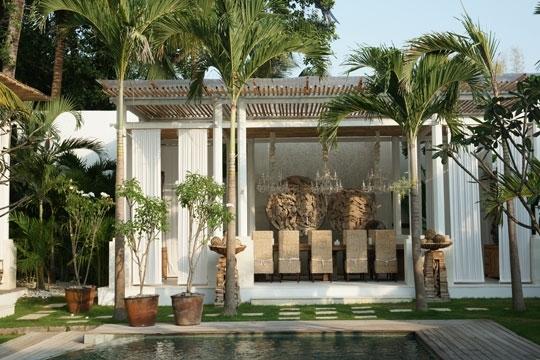 The shabby-chic white-themed property is characterised by antique Balinese doors, colonial furnishings, terraces and open living beside a private pool. Oazia has obvious connections with the word ‘oasis’, and in a world where names can often be ambiguous and disingenuous, it’s a pretty accurate turn of phrase. Surrounded by overhanging tropical trees, with a slow-flowing river passing between the dwellings and butterflies flitting from the frangipanis to the bougainvillea while birdsong is carried on the breeze, Villa Oazia White is like an Abercrombie & Kent jungle camp. This is a place for the privileged to experience the delights of tropical nature without the hardships of having no ice for their drinks or the dangers of tigers prowling through the camp looking for a midnight snack. 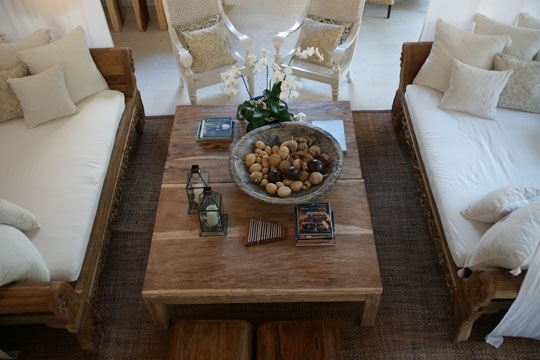 Spacious and open and with lots of shade and sunshine, Villa Oazia White is, as expected, predominantly white from the ground up combined with natural tones of bamboo and hardwoods making up the ceilings, furniture and parquet flooring in the bedrooms. 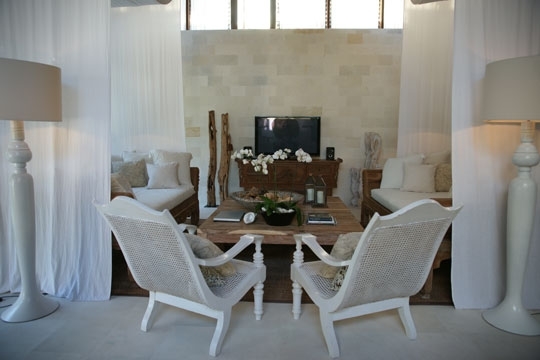 White dominates from the stone underfoot poolside, bathrooms and main living area floors, the yielding colonial-style daybeds, upholstery, curtains and even the flowers. Shabby-chic comfort is the theme, featuring distressed weathered paintwork and detailing combined with unassuming good taste to give it that ‘lived in’ feeling. 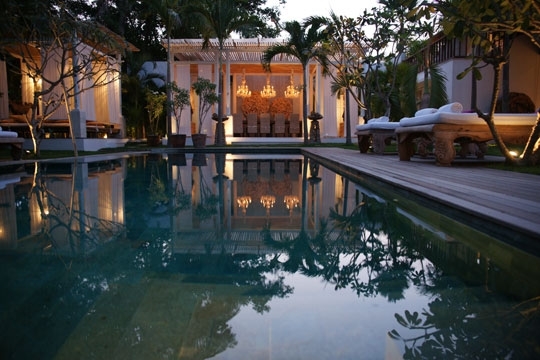 The romantic style is completed with Balinese statues, candles, billowing white muslin drapes and heaps of scatter cushions, while more than a touch of glamour and luxury is added with crystal chandeliers and a team of staff (including a car and driver inclusive of cost) to cater to every whim. The villa has its own kitchen for guest use, but delicious, healthy meals from a priced menu are prepared in a professional service kitchen. Uniquely, Oazia also offers a wonderful choice of spa treatments and holistic therapies (including a complimentary massage for every guest) in its on-site spa complete with yoga and meditation studio and an exceptional oval-shaped Watsu pool. The villa is therefore ideal for yoga retreats, detoxifying and wellness programmes, which can be personally tailored to meet guests’ individual needs. For larger groups, all three Oazia Spa Villas (one-bedroom Villa Oazia Orchid and two-bedroom Villa Oazia Aqua) can be rented, providing accommodation for up to 14 people. A tree-shaded setting that spans both sides of a gently-flowing river. 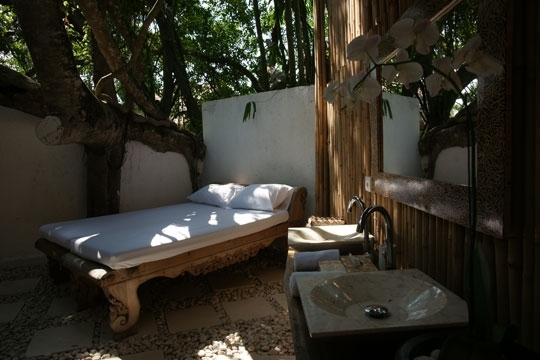 Oazia Spa Villas are situated on a bend in the river, within a traditional Balinese village, just off the main road running from Seminyak to Canggu. Although there are no amenities within the village itself, there’s a slurry of local shops and basic eateries serving traditional Indonesian food, plus a couple of ATMs, along the main road, but anyone looking to buy a designer outfit or some souvenirs would need to head into Seminyak (6km). 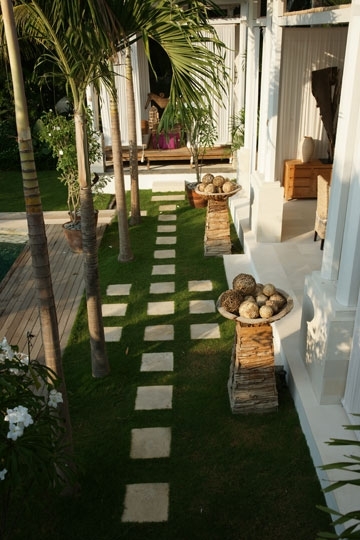 Located between Seminyak and Canggu, the area known as Kerobokan, which includes Umalas village and Banjar Semer, is conveniently close to Seminyak’s trendy restaurants and designer boutiques, yet is promoted as the peaceful option because these flat plains still encompass acres of rice fields and distant mountain views. Development, however, is happening fast, and this group of rural villages is now home to numerous rental villas and private residences, with plenty of cheap ‘n cheerful Western-style cafes cropping up in the most unexpected of places, offering surprisingly good food and home/villa delivery services. 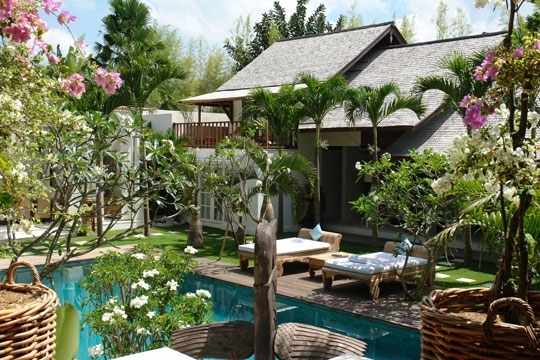 Although there are very few shops as yet, there are a number of local supermarkets, bakeries, garden centres, simple spas and fitness centres, as well as three riding stables at nearby Canggu – Kuda P, Tarukan, and Bali Equestrian Centre. Visitors will also find ATM machines and reliable taxi services. 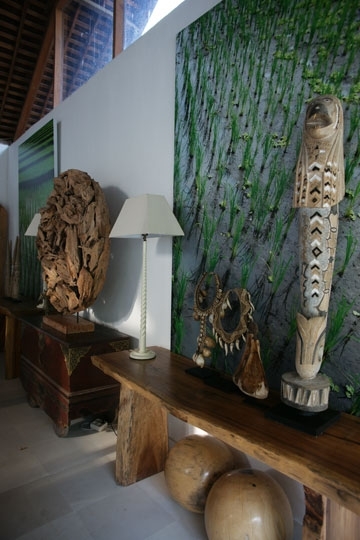 The main road leading north of Seminyak to Kerobokan is lined with furniture stores and workshops offering “antiques made to order”. Villa Oazia White is arranged on two levels within a secluded garden, spanning both sides of the river and linked by a bridge. The main pavilion is positioned beside the pool deck and houses the open-fronted living area and a circular table for six next to an integrated kitchen and breakfast bar. The living space is filled with two huge colonial-style daybeds and a large coffee table in front of a 47-inch TV and DVD player. 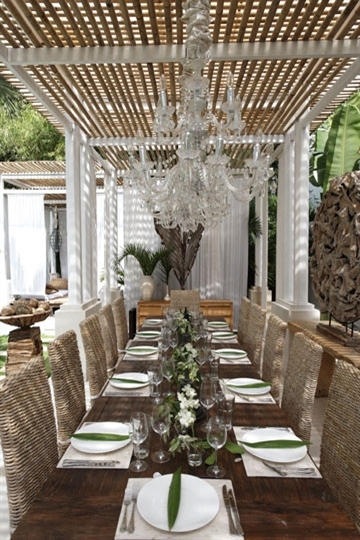 At one end of the pool is an open-sided dining pavilion furnished with a table for 12 lit by crystal chandeliers; next to this is a relaxation gazebo complete with a low table and yielding mattresses, while at the other end is a comfortable antique balé. 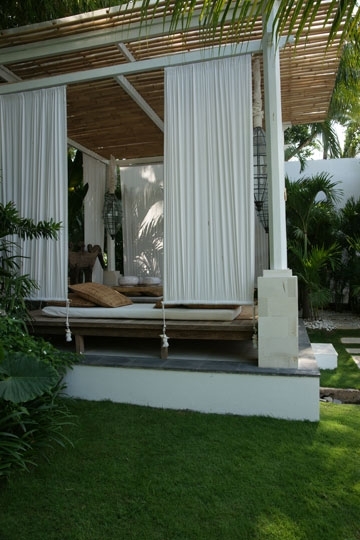 Reached via a bridge across the river, are two standalone pavilion bedrooms and a shared terrace. 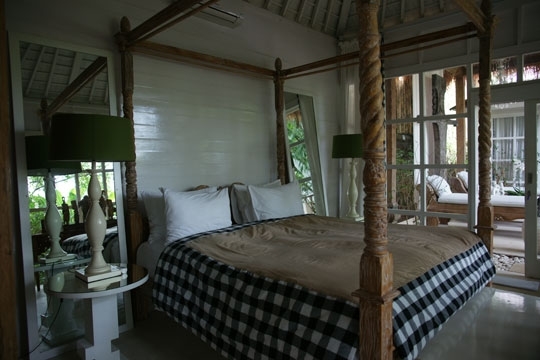 The four air-conditioned bedrooms at Villa Oazia White are all furnished with queen beds. 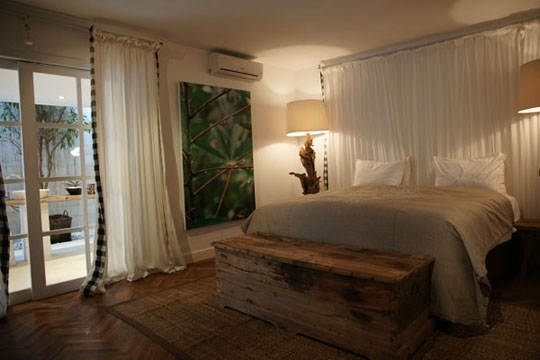 The upstairs bedroom has a private terrace overlooking the garden, complete with lazy chairs and a table. 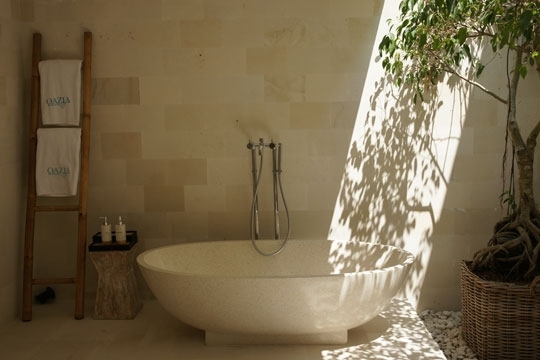 This extends to a bathroom with a monsoon shower and a soaking tub open to the sky. 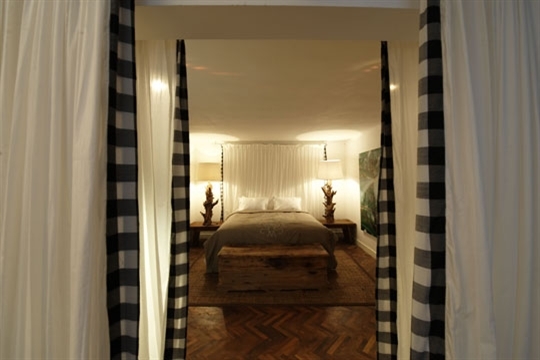 In the ground floor bedroom, a curtain separates the sleeping area from the dressing and sitting space, while its ensuite bathroom is semi-open-air with a soaking tub and monsoon shower. Both riverside bedrooms have delightful views and feature white painted walls, high roofs, four-poster beds and rustic open-air bathrooms with monsoon showers. 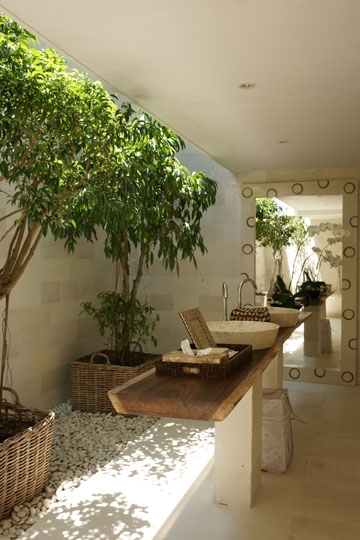 One of the bathrooms incorporates two mature trees, including a massive fig tree that grows through the high wall to create an enchanting backdrop. 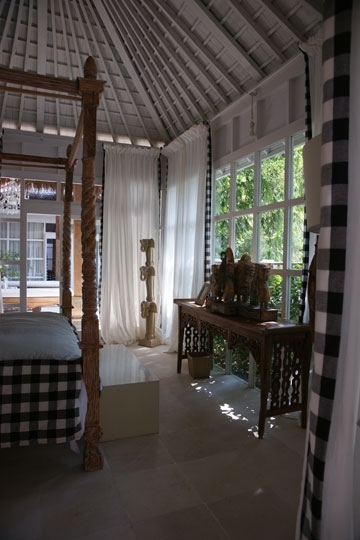 A terrace furnished with daybeds and sheltered by a century-old ornately carved joglo pavilion links these two bedrooms. The broad bridge is also a tranquil spot for reading or lazing on a colonial daybed. This dark sand beach is rugged but peaceful. It’s great for bracing walks and for surfing. There are swim areas, shallow pools and lifesavers in front of the Grand Balisani Suites hotel, but take care of dangerous currents outside of the designated swim areas. 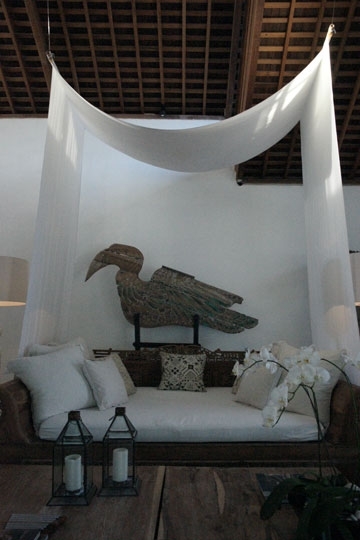 Independent beauty and wellness spa founded and run by local Balinese practitioner, Dewi. All staff are English-speaking, trained and qualified in a range of specialist treatments, including different massage methods and beauty and facial treatments. This newly renovated and rebranded restaurant at Hu’u Bar offers a menu of Southeast Asian cuisine including Peranakan dishes and home-spun Balinese dishes as well as a small bites menu. Check out the authentic Singaporean Laksa Noodles. This café and health shop offers a nourishing menu of dishes created from organic and preservative-free ingredients, including wholesome breads such as the 100% rye bread and rice flour bread, brown rice, and sugar-free and non-dairy beverages. Favourites include tofu & cashew curry, and eggplant almond enchiladas. Fusion Latin America restaurant, focusing on modern wood fire and charcoal cooked suckling pig, Australian lamb and beef and local seafood and salads. The restaurant is made from sustainable materials from Indonesia and has a beautifully decorated air-conditioned interior with a 10-metre-high ceiling. This restaurant specialises in high tea, and is housed in a charming 150-year-old Javanese teak Joglo building. There’s the wonderful Ganesha Bookshop too and an antiques gallery for afterwards. Eclectic international food (predominantly Asian) with drag shows every Friday and Saturday nights. Quirky interiors and an open-air roof terrace set the scene for wholesome Caribbean cuisine made with organic ingredients. One of the main special offerings at Bow is its superb daily brunches, defying the restaurant trend of late breakfasts offered only on weekends. Closed on Mondays. A café, bakery and upmarket bistro – house specialty are steaks and meats – with eclectic interiors and an upstairs ‘mansion’ providing a bar, dance floor and DJ music. Cocktails incorporate only-natural ingredients with no added sugar, and Charlie is the only bar in Bali that serves on-the-rocks drinks with the hand-carved crystal-clear ice cubes. Hu’u Bar remains a favourite destination for hipsters, offering nightlife, fine dining at Baba’s, bar events and legendary lychee martinis. Club lounge with great music and tasty cocktails, Mint regularly plays host to top international DJs. The interior features rich materials, including dark timbers, marble floors, a backlit glass bar, comfortable sofas and private lounging areas, all amazingly lit for intimacy and effect. Open every Thursday, Friday and Saturday from 10.00 pm to 3.00 am. Attached to an upmarket jewellery store, the elegant and comfortable air-conditioned environment at Jemme contributes to make this restaurant an excellent choice for a wonderful lunch or dinner. House specialties include Cumberland pie, classic steak and chips, lobster and prawn thermidor, chicken leek & mushroom pie, and the famous roast dinner weekend menu, which is available all day, all weekend. Open-sided restaurant with tables spilling out onto a covered terrace. Serves authentic Italian cuisine in generously-sized portions. Pizzas, breads and pastas are made in-house with the exception of the spaghetti. Most of the food on the huge menu is inspired by Napoli with seafood a specialty, the spaghetti vongole is wonderful. Mama San serves pungent Asian comfort food in fine-dining style within a purpose-designed industrial warehouse with a Shanghai Grand-era vibe. Enjoy a pre-dinner cocktail on tan leather chester?elds in the upstairs lounge, reminiscent of a bourgeois gentlemen’s club, then dine downstairs on Chinese, Indonesian, Indian, Malay, Singaporean, Thai, Cambodian and Vietnamese cuisine, with dishes such as roasted Peking duck with hoisin belly sauce, Thai fish cakes with sweet chilli sauce, and black sticky rice with mango & coconut cream. Rustic charm abounds at Mantra, complete with an eclectic décor and a menu of Asian fusion, burgers, seafood and vegetarian dishes. It’s fun to hang out in the bar, with DJ or live music. Cavernous, fine-dining restaurant and bar, showcasing spectacular, majestic architecture (to describe the interior would spoil the surprise… when it’s raining it’s even better). Serves classic Indonesian cuisine using ingredients of the highest quality alongside creative dishes that experiment with traditional spices and flavours from across the archipelago. Offers a unique collection of contemporary art by both established and emerging artists. The name Rob Peetoom has long been associated with beautiful hair, makeup and skin care, and his hair spa in Bali is a place that invites you to enjoy long, luxurious hair and beauty treatments. 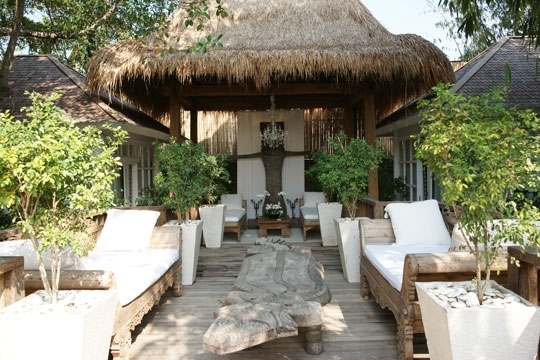 This highly acclaimed restaurant serves up beautifully fresh seafood in a breezy polished bamboo pavilion or on a terrace overlooking a working rice field that has been decorated with parasols, teracotta urns and clever lighting. 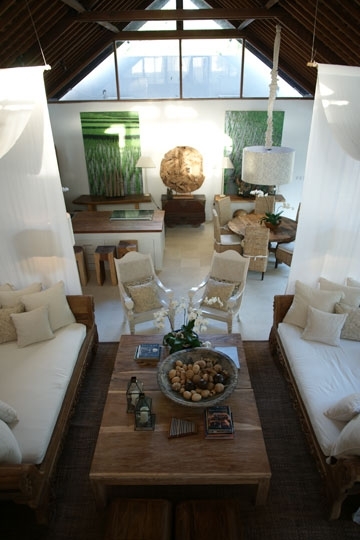 Oozing with visual texture and lush fabrics, Sarong is comprised of two open pavilions. Here, organza drapes in shades of old gold fall in folds from the high roof; random Chippendale meets quirky millennium, and tables spill out into a candlelit garden. The menu features the great cuisines of Southeast Asia with dishes from China, Thailand, Malaysia and India. With an extravagant décor that evokes the spirit of the fire-themed kecak dance, Fire at W Retreat showcases a fired grill and pizza oven at heart of its open show kitchen. Promises gourmet pizzas, stir-fries, seafood, and freshly sourced fine meats – such as such as a master Kobe striploin with a marble score of 9, and grain-fed Black Angus prime rib aged for 200 days. Beachside restaurant offering Pan-Asian cuisine. Guests can chill on beachside beds while enjoying crushed cocktails as well as delectable raw bar and tapas selections. 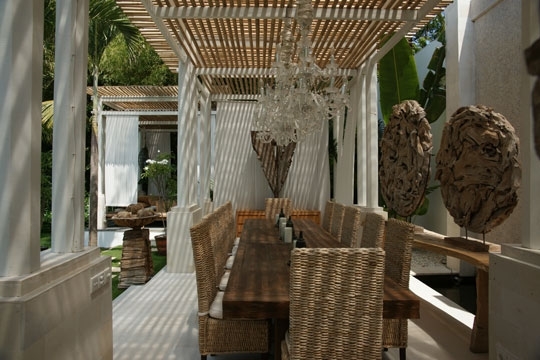 The design was inspired by the Balinese fishing lifestyle and features oversized booths evocative of lobster traps. Dishes include coconut marinated salmon and Thai red curry of duck. Starfish Bloo is also well known for its Sunday Brunch, with live DJ or acoustic performances and kids activities. By day, WooBar is a super-chic, cool, relaxed beach club with delicious nibbles, an intoxicatingly extensive choice of imported beers, wines and unique cocktails. When the sun goes down, WooBar welcomes you to play. Sip on high-voltage cocktails specially prepared by the liquid team, and let Bali’s hottest DJ’s whisk you away in the music. Enjoy tantalizing finger foods at the bar, or get cozy in one of WooBar’s many secret indoor and outdoor spaces. Bali’s only local village pub serves up icy cold beers, hand pumped Guinness and Kilkenny, cocktails, great grub, Sunday roasts, live sporting events on the big screens, quiz nights, and a whole lot more besides. Moderately priced, immaculate and indulging manicures and pedicures in the alluring ambiance of a New York City style nail parlour in Bali. The salon has chic pedicure spa chairs (with a rolling massage feature) in the pedicure theatre, a manicure bar equipped with iPads in every seat, a separate acrylic/gel nail extensions room, a private treatment nest for waxing, and a nail drying station. Serves French and Mediterranean inspired cuisine and fine wines in a charming open air setting with a terrace that wraps around a central courtyard. Walking into this Japanese restaurant is like walking into someone’s peaceful villa-home, complete with a decorative swimming pool. In fact, the place is so discreet that thousands have driven past and not even noticed it. Typical Japanese cuisine with excellent attention to detail and beautiful presentation. Vegan & Vegetarian Café & Wholefood Store. Homemade cakes, fresh salads, tasty soups, healthy bakes, spring rolls, veg burgers, wraps, pita with dips, smoothies, breakfast menu, juices & much more. Eat In/Take Away/Home Delivery/Special Events/Wholefood Store. Kolega serves an Indonesian ‘nasi campur’ lunch presented buffet style, where you select the type of rice you want and pick the dishes that catch your fancy. The counter will issue a price ticket, which you use to pay after your meal. Traditional Indonesian dishes include fried chicken, beef rendang , fish and vegetables and spicy sambals. In Javanese, the word Suku means foot, and feet were the original focus of this House of Reflexology when it first opened, with its highly trained therapists. 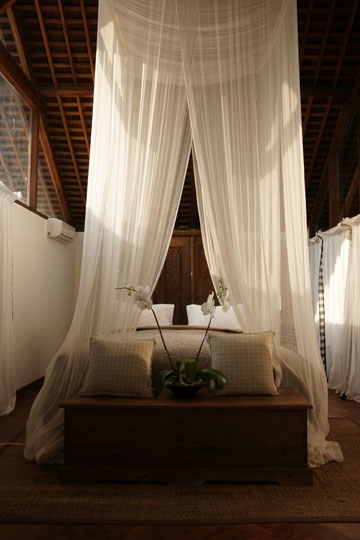 Superior massage, however, is so sought after in Bali that massage beds were also installed and ‘Relaxing’, ‘Aromatic’, ‘Therapeutic’ and ‘Traditional Massage’ were all added to the menu. Small French café and bistro with an all-day breakfast menu and classic French fare on the lunch menu. In the evenings it is transformed into an intimate bistro that offers a selection of sharing plates, followed by some classic rustic main courses. Set in a traditional Javanese joglo house, Café Degan offers a selection of popular Indonesian specialties, and a carefully chosen assortment of Thai favourites. Small cafe that’s up there with the Bali’s best. Customers can look forward to friendly service, superb coffee, and a menu of fresh pastries, sandwiches and salads. It is also very kid friendly and includes a kids’ menu. Come here for a quick cheap snack. Dishes include western and Asian fare including pasta, pizza, steak, burgers, nasi goreng, fried rice, stir fries and their famous mulberry pie. This is a busy, but very reasonably priced family restaurant offering good steaks as well as Indonesian and Balinese cuisine. 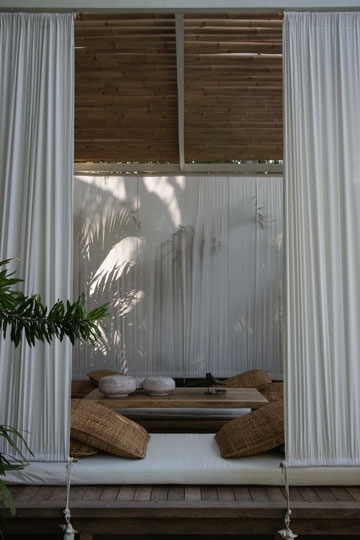 Tucked behind towering walls, Bambu is a tranquil little water paradise with fish ponds and a virtual 'floating' dining room. The staff are beautifully dressed in traditional costume and trained to perfection. The food is delicious, high quality Indonesian cuisine with a modern twist. Check out the Street Style Pancakes. 4 bedroom villa located in Umalas-Kerobokan, Bali. Ideal for Beach in ten, Bring the relatives, Kid friendly, Going for golf, Fair share for groups, Party pads, Spa sensation.